by Natalie Lymer of Cinderberry Stitches. My chosen fabrics - "Butterscotch and Roses"
I have left the pesky 1 1/2" squares for another day. catch up with you in a little while.....don't forget your crochet hook & wool! :) Barb. Do you ever sleep? It will be a lovely project to work on. Have a great day out. Sharon I got your super sweet package. I was at awwwww when I opened it. 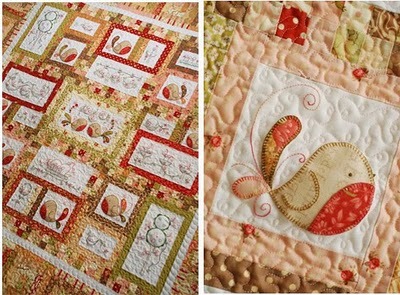 The little quilt you made is gorgeous I just love it in all it's vintage fabric glory. You spoiled me with all the vintage fabric squares and oh my the ornaments and little trinkets. You totally made my day. I am your newest follower and look forward to getting to know you. Love your quilt and also that fabric. In have some as well. Just waiting for the right project. I hope you have a wonderful bloggy meet. I'm part way through making this. It's a lovely pattern. Instead of 1.5 squares, piece 7 strips together and then trim into 1.5 inch columns. I think this works better. I love your fabric choice. lovely fabric, and you have made a great start! I have Tail Feathers sat in the cupboard all ready to start! I got the patterns from mother-in-law and the fabric from my parents for Christmas 2010. I feel I should finish other things before I start another (I know - doesn't normally stop me). I think I got the fabrics it was originally made in - your's is going to look stunning and I can't wait to see it finished - if your start is anything to go by I won't have to wait long! Great projects! Hope you had a wonderful day yesterday. How far is it from your place to Ballan? One of these days I might just get brave enough to come visit Mill Rose too. and i just LOVE Butterscotch & Roses, I bought a big ole FQ bundle of it recently for a quilt that's on my Plan.